We do not own any oil palm plantations, nor operate any palm oil refineries. Instead, we source from carefully selected, responsible producers in Malaysia and Indonesia that are committed to certification and principles of sustainability. All the palm oil we have used has been fully traceable to the plantation level since 2007, and 100% certified since 2013. PFAD is a processing residue that represents a very small proportion of a refineries overall production volume. This results in a PFAD supply chain that is both extensive and complex. 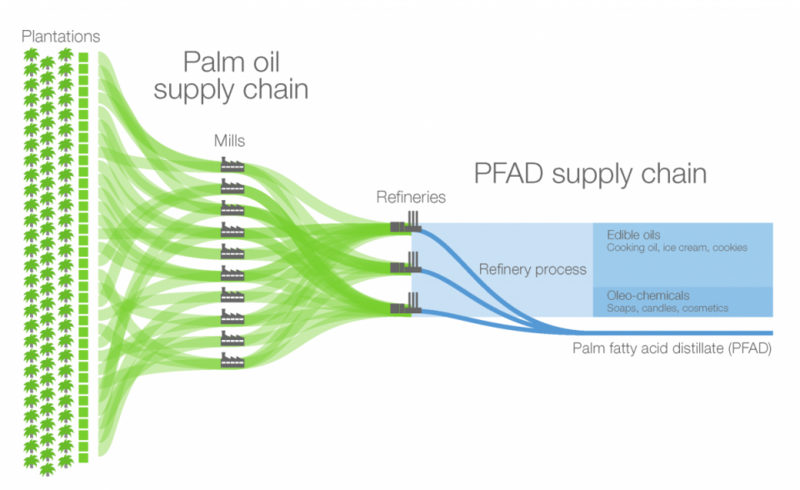 We are now committed to becoming the first in the world to map our entire PFAD supply chain all the way to the plantation level. Our portfolio of more than 10 sustainable renewable raw materials, palm oil and PFAD included, enables us to produce our renewable products that help our customers and the socety to reduce crude oil dependency and climate emissions. An extensive raw material base provides flexibility, as it allows us to respond to the needs of different markets and customers. In recent years, we have focused on increasing the use of waste and residue raw materials. They account for approximately 80% of our annual renewable raw material usage. Learn more about our sustainability efforts and our process to ensure sustainability of all our raw materials.